So I don’t like spiders. But they are a part of living in the DR, and I have learned to tolerate them. Well, at least I thought I had learned to tolerate them. 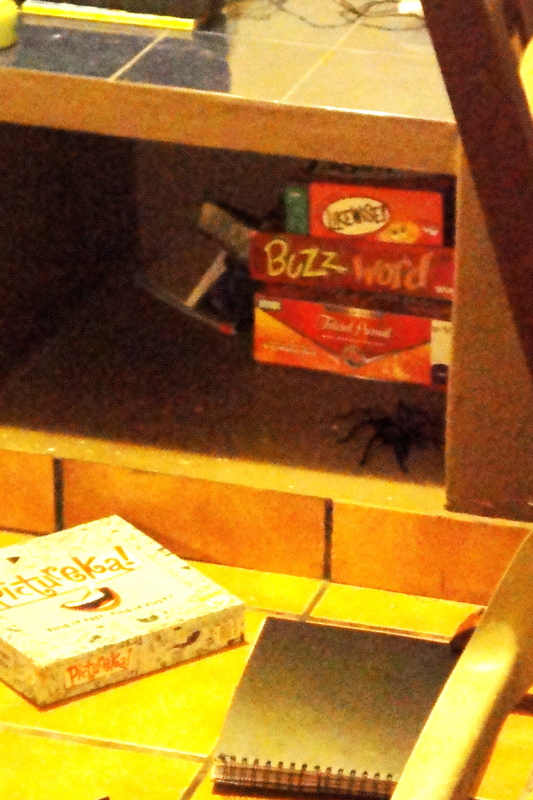 That is, until a gargantuan tarantula appeared in our kitchen. I mean, like, this guy is easily the biggest spider I’ve ever seen in my life, including the ones in zoos. The height of his body was maybe 5 inches (which is a lot when you’re a spider), and his width was easily as much as my 2 hands put together, side-by-side. 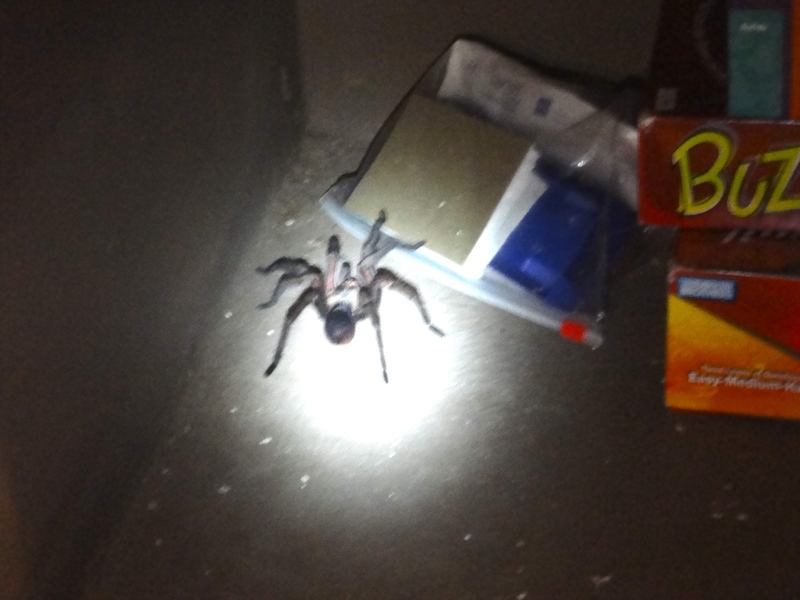 I don’t even know how to describe to you the terror that ensued upon realizing that our clean, safe home had been compromised by the said GIANT aranchnid. I would love to tell you that I was really brave and crushed him with a cinder block; or that I was very PETA-friendly and just shooed it outside. But I did neither of those things. What I did do was tell Evan (very calmly, might I add) that there was a tarantula in our kitchen, and then I locked myself and our dogs in the bedroom. I don’t know exactly what happened in that kitchen for the next 10 minutes (I think there was Raid and a rake involved? ), while I was hearing yelling and furniture moving around, but I do know that a valiant battle was fought. I also know that my brave husband proved himself victorious in not only slaying the beast, but managing to snap the spider’s photo, as well. Don’t worry, it’s coming. So check back later. Be prepared to be grossed out. Neither pic is great because we were terrified. But there it is. Or was. We finally get to a place where there is a 50-ft tree laying across the road and a couple of truckloads of Dominicans yelling about water. These people are smashing bottles in the road, and there’s no way around it. We learned from someone on the street that the people were protesting a lack of water up on the mountain and that the press was coming at 11 (It was 9AM at this point), and the protest would end after that. While we’re trying to figure out what to do, a guy gets out of the truck behind us and starts talking to us (in Spanish). About 2 sentences into the conversation he says, “Wait, do you guys speak English? I’m from PA, and I go to Penn State.” Obviously he speaks perfect English (God has a sense of humor). Not only that, but the guy who’s driving the truck he’s in knows a back way to get around the protest. We end up following these guys down some back country road (thank goodness for 4×4), praying that they’re not leading us out into the wilderness to rob and kill us, and we came out on the other side of the protest 15 minutes later. We made it safely to Santiago shortly after. With four good tires. I think it was a much-needed lesson that, if God cares enough to give us a way out of our little struggles, He’ll be faithful to lead us out of the big ones, too.